Bonjour à tous!! Joyeux Vendredi!! Happy Friday everyone!! 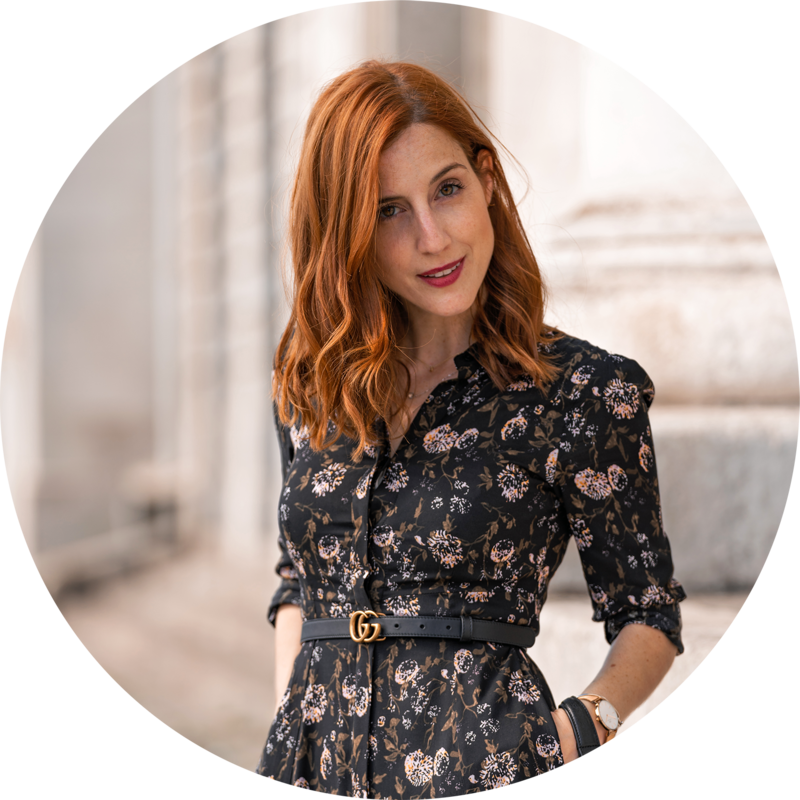 The time to leave Paris has arrived once again - have you followed my Paris trip on @styletraces instagram HERE?! It's tough when you have to live a place you enjoy so much but, the good thing is to keep believing that you might return soon again! And, as after Paris comes the time to land in my country, in my hometown that I'm missing loads... I wouldn't be so sorry because there will more promised happy moments ahead. 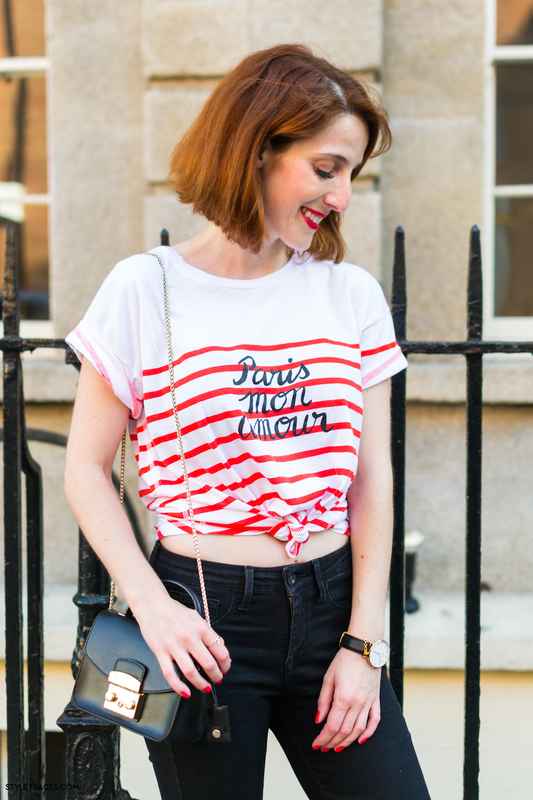 Perfect to remember my love from Paris and to make Paris closer to me, is this t-shirt, even on a lovely Dublin afternoon like this I bring you today, with this look. 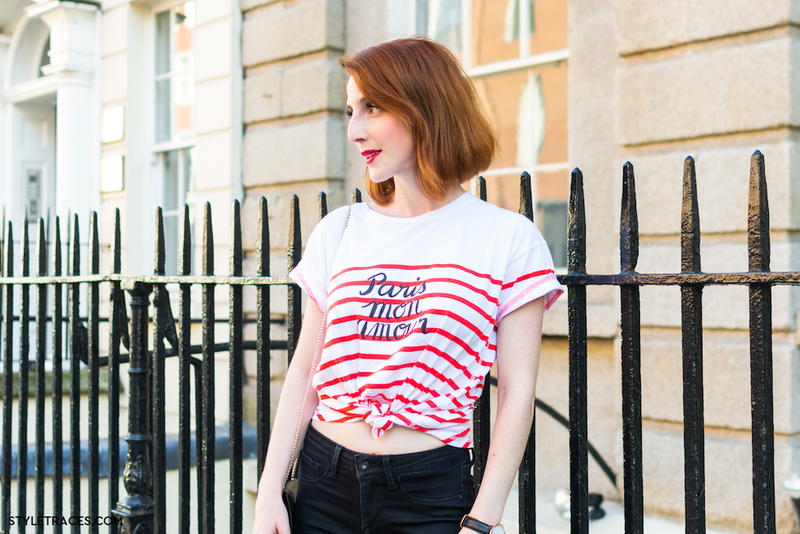 For my first time with this t-shirt I tried to avoid denim and match it in a casual chic look, with black, white and red stripes, perfect french touch with Parisienne feelings! Hope you enjoy it as much as I did! Bonjour à tous!! Joyeux Vendredi!! Boa Sexta Feiraaa!! Chegou a altura de deixar Paris mais uma vez - quem seguiu a minha viagem a Paris pelo instagram @styletraces AQUI?! É sempre difícil deixar um lugar que gostamos tanto mas, o bom é acreditar que em breve podemos vir a estar de volta! E, como a seguir a Paris chega a hora de aterrar no meu país, na minha cidade, que estou cheia de saudades.... não custa assim tanto deixar porque mais momentos bons prometem vir a caminho. It's Friday!! SO, let's have FUN!! let's just be HAPPY!! É Sexta Feiraaa!! vamos à DIVERSÃO!! ser FELIZ! !